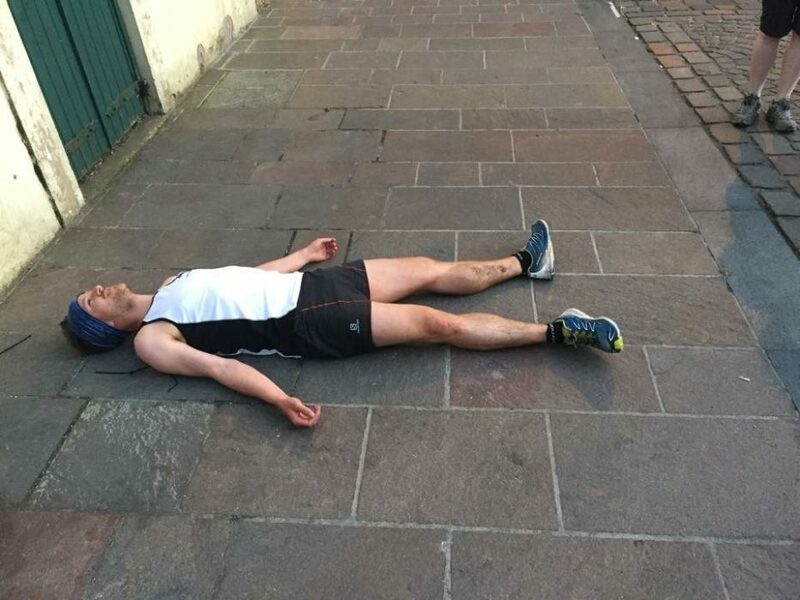 Earlier this month Joe Williams completed the Bob Graham Round, the famous memorial circuit of the Lakeland fells covering 100km and 8000m in under 24 hours, starting from Keswick. Here he shares the anticipation, the agony and the downright joy of an unforgettable day. At 00:57 I quietly sloped off round the back of the Moot Hall to give myself a bit of a talking to. 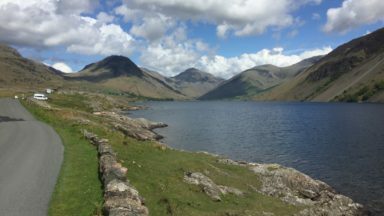 In three minutes’ time I was to set off on a mountain run around the Lake District that I expected to take up to 24 hours, and I wanted just a few moments to collect my thoughts in private. I didn’t come up with anything new and inspiring to motivate myself. Nor was anything really needed. For the past week I had been gradually preparing myself mentally for the longest mountain run of my life. I was completely prepared for any dark times that might lie ahead and I knew it. A quick look at the watch: 00:59. I walked back round to my waiting crew and pacers and saw that everyone was ready. A quick touch of my hand to the hall and a press of the stopwatch then we were off. I kept my speed in check and, to my surprise, felt quite calm. 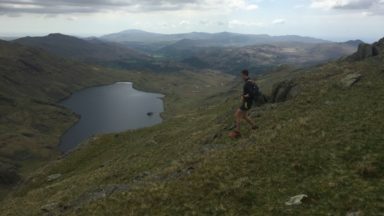 I had – after so many months of preparing and (literally) dreaming about it – just started my attempt to complete the Bob Graham Round, probably the most well-known mountain running challenge in the UK: to start in Keswick, touch the top of 42 peaks and return to the starting point in under 24 hours under your own steam, covering around 100km and over 8000m of ascent. It felt unreasonably easy walking up Skiddaw. I wasn’t carrying a thing (my pacers carried all my personal kit, food and drinks) and my legs finally felt fresh after months of relentlessly training. The wind was blowing hard up Jenkin Hill, and Toby and Gromit lined up to protect me from the wind, in much the same way that the peloton spreads out against the wind to protect its most important riders in cycling. Skiddaw was dispatched a few minutes under schedule: I’d tried as hard as I could to go as slowly as possible! Hunched against the wind, I ploughed on down as the guys wrote down our summiting time, peeling off the path shortly after the summit. The GPS track on my watch showed me exactly where to go and we crossed the fence at the right spot. Descending the grassy slopes towards the bog below Calva and chatting to Gromit, I turned my ankle painfully, so that I had to walk rather than run for five minutes. 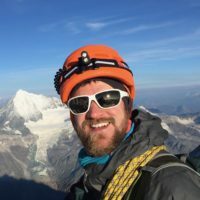 Only a debilitating injury was going to stop me from completing the round, and I certainly didn’t want to have to retire after only one summit. From that moment on I focused all my attention during every descent. Calva passed easily and then the deep, scratchy heather of the descent trod took us to the river Caldew. We waded it quickly and set off to pick up the faint path up the back side of Blencathra. This is one of the longer climbs, so to help the time pass I asked Toby to tell us a story. For the next twenty minutes, Toby narrated the story of Count von Dracula, painting a picture of misty Transylvania for us. Back in Cumbria, there was lightning in the distance, the wind was howling and the clouds were just starting to be seen in the eerie light of pre-dawn: the scene was wonderfully set. Moments later we summited, then found the start of the Parachute Drop – my preferred descent of Blencathra (fast, steep and grassy; much easier than Hall’s Fell in damp conditions). After a few minutes we were hundreds of metres below the summit, but the guys were slowing slightly. Impatiently, I shouted up to tell them how to get the rest of the way down and sped off. Soon I was arriving into Threlkeld where a reception committee awaited. The team sat me down in a camping chair, and before I knew it a stranger (and long-time BG supporter, Ian) was removing my shoes and socks and cleaning my feet. Other hands passed me a cup of tea and a pot of porridge. A change of shirt and a fresh waterproof jacket and I was set. This amazing pit crew of friends and family worked throughout the day to keep me fuelled, clean, comfortable and ready for the next leg. Thank you all so much. About a kilometre of road running brought us onto the fell and the pull up Clough Head. 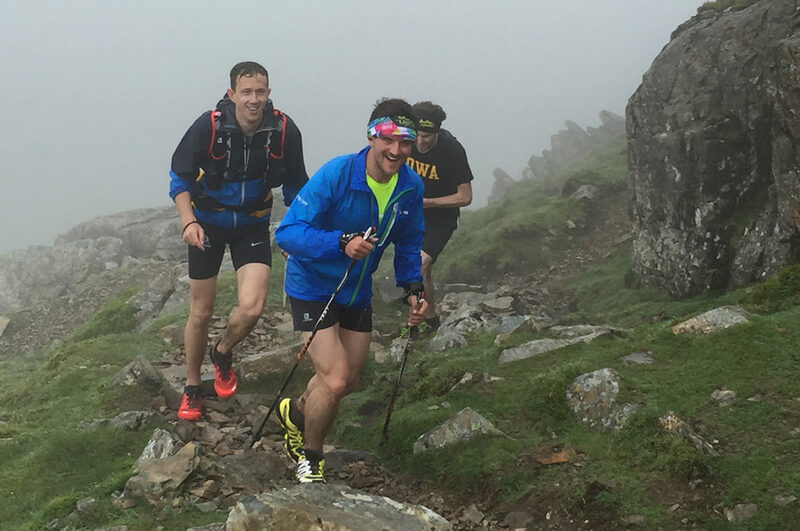 My new pacers were childhood friend Aidan (new to fell running) and BG club member Coxy. The chat was pleasant until we entered the cloud near the summit. My plan had been to run these first two legs at a strict 23-hour pace, then press on during Leg 3 if I was feeling good. On Leg 2 I knew I could do it just by matching Aidan’s natural pace. After less than an hour the weather evolved: the clag came down, the rain began, the head- (and cross-) wind blew, and the sound of thunder grew ever closer. Descending Stybarrow Dodd to the col before Raise it reached its climax. The rain was some of the heaviest I have ever experienced in the UK. Climbing up the relentlessly steep Steel Fell, I felt too full but, although I had been eating and drinking plenty and had good energy levels, I was told that I wasn’t eating enough. Giles and John, my new team, mercilessly bullied me into eating every 10 to 15 minutes. I didn’t feel sick but I just didn’t need this quantity of food. It reminded me of stories of contenders being handed food in the latter stages of the round, then waiting until their pacers looked the other way before throwing away or hiding the food. Thankfully, I never had to do that on Leg 3. The leg began to take a turn for the worse on only the second summit. The route on my watch had gone haywire and no one knew where we really were in the clag. Eventually we remembered to get the Viewranger app on the phone fired up and we slowly located the summit. Running off Calf Crag, I felt a sharp pain in my right knee, something I’d never experienced before. 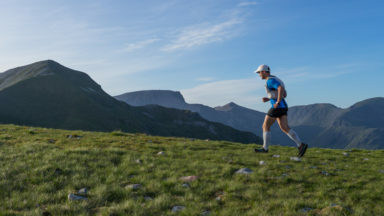 The pain surged through my knee whenever I was running (flat, up, down) or descending, and my spirits plummeted. I tried my best with the descents, grimacing through the pain, and tried to make up time on the climbs. I’d cut ten minutes out of the schedule on the climbs, then lose it all on the subsequent descent. The rain had at least eased, but the cloud was still dense. Meanwhile, I was still trying to put away the hundreds of calories that the guys were trying to jam down my throat. Even dropping a flapjack into a stream didn’t stop them from making me swallow the soggy mess. Descending Scafell Pike (frustrated by the customary hordes at the summit), I sent Giles on ahead to warn my Broad Stand rope man of our imminent arrival. I hobbled down to Mickledore and traversed across to the awaiting harness and rope. ‘Hi Rob!’ I screamed into the wind. 'Where the ****’s Giles? !’ In the clag, Giles, having never been up the short rock climb (and most direct route up Scafell) of Broad Stand, had completely missed it. Those following our progress on the Open Tracking website will have seen that Giles (carrying the tracker) descended almost into Upper Eskdale before realising he’d gone wrong! Meanwhile, John spent ten minutes trying to find our misplaced friend before I told him to give up and join me. I hauled myself up the soaking slabs, begging for a tight rope from above. ‘The Move’ wasn’t possible because of the slipperiness of the rock. I hauled using my arms, wedged my feet and used my knees and arse to get up the thing (and to think I call myself a climber!). I surprised Rob by giving him a big and slightly awkward hug as I removed the harness. It was becoming clear to me that today I wasn’t going to respond to any ‘tough love’; kindness and positivity were what motivated me on the day. I raided Rob’s bag, stealing a Mars Bar and Baby Bell before setting off up the greasy scramble above. John eventually joined me near the top of Scafell. I estimated that we’d lost half an hour from this faffing about. 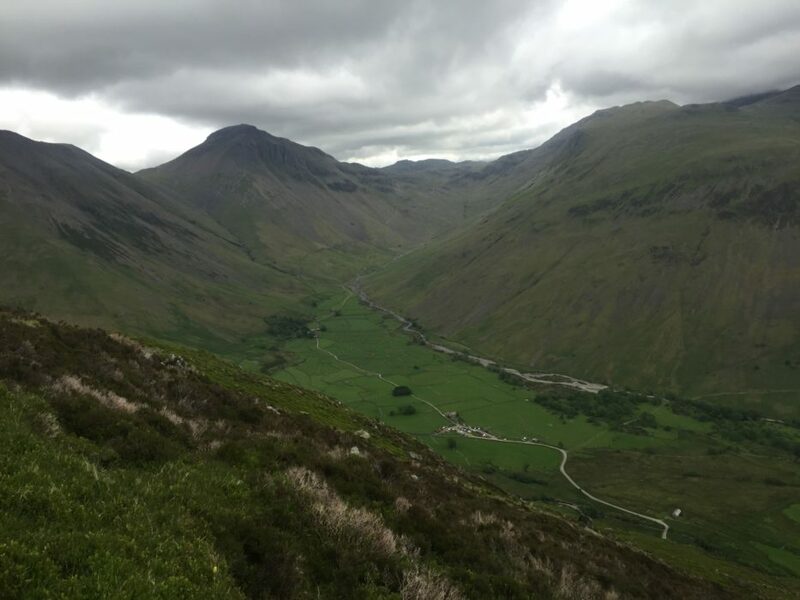 I was pissed off, and the looming 900m descent down to Wasdale wasn’t helping matters. It was agonising every step of the way, but I made myself concentrate on just getting to Wasdale... and not thinking any further ahead. The new pacers were a mix of old friends and completely new faces. My regular climbing partner, Tania had come all the way from Chamonix to pace me for a few hours. I couldn’t let her down (and I know she would tease me if I started getting wimpy). Then there was Rob and Steve, both BG veterans and expert navigators. 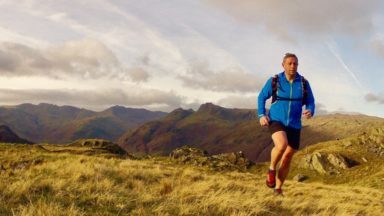 I immediately felt in the company of pros, and concentrated on trying to keep up with them during the blistering pace up Yewbarrow. Didn’t anyone tell them i’m feeling sorry for myself? Hmm, don’t say that out loud... I’m really tired, my knee hurts, can’t we just take it easy for a bit? No, don’t mention that either, just see what happens if you keep going. For the first time in the round I was breathing hard and putting in a good effort on the climb. We crested the top of Yewbarrow and I headed straight off, fearful of the impending pain that downhill running would bring. It didn’t come. 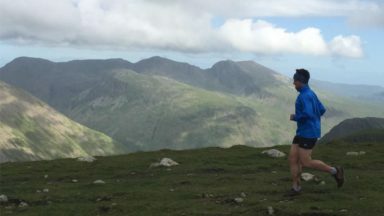 I didn’t push the pace, but – by some kind of Bob Graham miracle – my knee had suddenly fixed itself. What’s more, the weather had finally perked up and we had dry rocks and just a slight breeze to go with the occasional cloud well above the summits. I took every climb of the leg at about 80% effort, driving with my poles, happy to be breathing harder for a change. Tania was in charge of looking after me. She gave me my ‘pink’: an unusual carbohydrate drink on the hour and half hour, and then gave me a gel and water on the 15 minutes in between. Occasional jelly babies supplemented this, along with a brownie. I was so happy not to be eating any more soggy flapjack! The other things that brought me immense and long-lasting pleasure were my clean dry feet in my fresh dry socks in my new dry shoes. I had switched from Salomon Fellraisers (fell shoes) into Brooks Cascadias (trail shoes) and the extra space and protection brought me great joy (I’m so easy to please). I spent the whole leg trying to keep up with pacers who were doing an incredible job of finding the most devious route up each peak. Rob and Steve spoke to each other in a kind of code: ‘Do you want to go down by 58 here, Steve?’ ‘Yeah, it’s better than 30 as it’s on the grass for longer.’ They were talking in bearings, memorised as the result of years of experience. I felt utterly privileged to be following them over the fells. After a resupply of water from my Broad Stand man, we kept going with my dog Cassie now in tow. She lead the way up Gable, and brought a good deal of morale along with her. The updates I was getting from the pacers were boosting my confidence: ‘22:30 schedule this, Joe’, ‘You’re on for 22 hours finishing now’. I could smell the finish and my legs felt great. I hadn’t felt this good since the start of Leg 2. My energy was up and I was getting excited! This is the moment I have fallen in love with in ultramarathons: that time when you are tired and have been on the go for many, many hours, yet you know that the end is attainable, you’re gonna do it, and you are running at your best. Soon we were crashing down into Honister, being guided into the back car park for the last crew station before the end. The changeover at Honister took seven minutes. I was certainly feeling tired now, but my legs felt good and I was ready to finish this thing. Finally I was joined by my uncle, on what was probably our first proper run together ever. 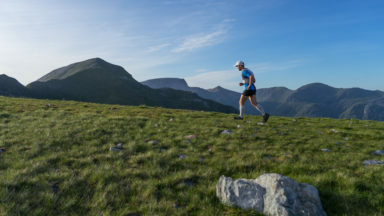 Thirty years ago to the month, he too had been charging up Dale Head on his own Bob Graham Round, desperately racing the clock in order to get back to Keswick under the 24-hour time limit. He did it with about 15 minutes to spare: a day of drama! There wasn’t much drama for me over those final three summits. The decent weather of the afternoon had transformed into a tremendous evening. On the traverse from Hindscarth to Robinson my three pacers ran on ahead and I got to spend a couple of minutes on my own, enjoying the moment and contemplating what had just happened to me. We crested the top of Robinson and could finally see Keswick a few miles away: not far to go now. The descent wasn’t too painful, despite the steepness, and soon we had hit the farm track, then the road. Eight kilometres of road was all that was left, and I knew that we could sneak under the 21-hour mark now, so six-minute kilometres were the order of the day. It passed quickly with so many of my earlier pacers and friends joining for these last few miles, chatting, laughing. During those last few minutes I wasn’t desperate to finish. I was ready to be done – for sure! – but I wasn’t suffering. Coming in to town my uncle put a hand on my back and told me to run it in hard. Feeling like I was sprinting (the video footage shows I was actually moving much slower! ), I stretched my legs out, smiled and reached out to touch the Moot Hall. Everyone was there, clapping and smiling. I didn’t know what to say. I couldn’t think either. So I just lay down on the street, flat on my back, looking up at the blue sky and let the swathe of emotions flow out of me. 20 hours and 51 minutes… I’m happy with that. 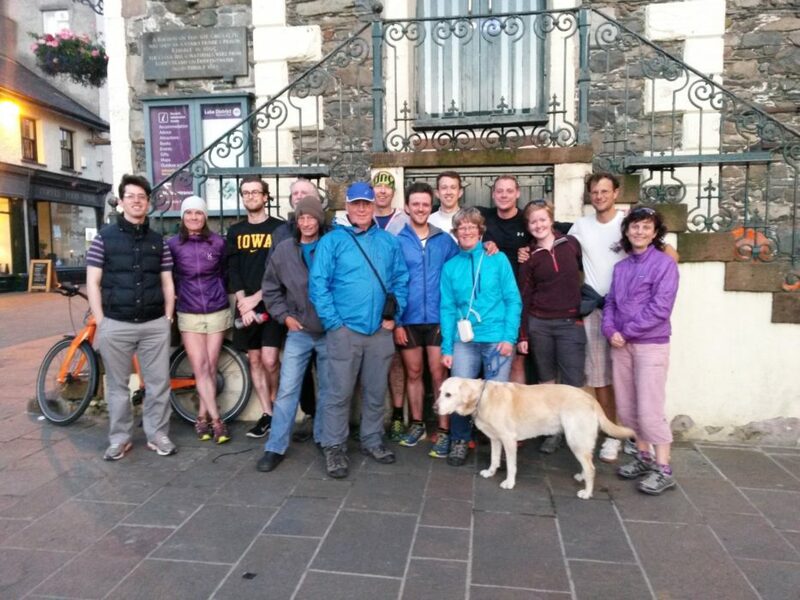 Find out more about the Bob Graham Club.